A reporter’s stories from traveling with a small Siberian tribe, who have been living in East Siberia since the Neolithic Age. It is late April, the ice road is already closed, but the taxi is still running, skirting around ice holes. People are using the last opportunity to reach their remote settlements. Soon there will be no road here whatsoever, and this is how it will stay until the middle of June, when the ice has melted and motorboats have sprung into action. It is hard to get one's head around local distances: 500 kilometer to the district capital, 3,500 kilometers to Yakutsk. A territory the size of Europe but absolutely uninhabited. Tundra, taiga, cold rivers and lakes, and mountain ranges that used to be populated only by wild animals and rare nomadic families of hunters and fishermen. Now they, too, have become almost extinct. I am driving together with the chieftain of Yukaghir, Vyacheslav Shadrin, a big, shy man in glasses. He is something of a social worker, roaming around the villages, helping people with papers, sending a child to hospital or getting the ministry to allocate a snowmobile for the community. “I remember my grandfather pronouncing my destiny once. ‘He will never grow into a hunter,’ he told me. And so I was sent to the city to study. But I always knew that I would have to come back,” he says. The Yukaghirs are an indigenous, pre-Tungusic people of east Siberia, who have lived in this area since the Neolithic Age. They traveled in families, in yurts and half-dugouts, hunting and fishing on the riverbanks. They used stone tools until the Russians arrived into the area. Their culture was based on ancient beliefs: ancestor worship and shamanism. Here, in the cold taiga expanses of east Siberia, there survived until very recently a Stone Age culture. When a Yukaghir shaman died, his body was cut into pieces, the meat dried and distributed like good-luck charms, and his head was erected into a wooden body, dressed in fine clothes and put inside a house like an icon. Kolymskoye and Andryushkino are neighboring settlements, 240 kilometers apart. Each has about 800 residents made up of Chukchis, Evenks, and Yukaghirs. From the outside, settlements beyond the Polar Circle look rather ugly. Local reindeer herders and hunters never used to live in settlements, such as the miserable two-storied barracks on the banks of the Kolyma river. Reindeer hides hang everywhere drying, lying around, slowly emerging from under melting snow; they are clearly not considered here to be anything of any value. The most surprising thing here is the prices, which are four times as high as in Moscow. A packet of milk and a dozen eggs are $7 each. Everything here is brought by air, while a ticket from Yakutsk to Chersky costs $1,000 one way. People here do not have any money, only a lot of meat and fish. In 1937 a young linguist, Yuri Kreynovich, found himself in a Kolyma labor camp. There he met a Yukaghir man and began to learn his language. When he was released 17 years later, he wrote a doctoral thesis about the Yukaghir language; ever since then the language has became a favorite with linguistics. The Yukaghir language does not have relationships with other languages, a testament to how ancient this culture and people is. One of the most unique things about the Yukaghir people is that they had their own script. Their ideographic script is unlike anything else, it is not like an alphabet or hieroglyphics but more like an elaborate pattern. It was used only to write letters. Scientists believe that this written language dates back to the Neolithic cultural heritage originating from cave drawings. This may well have been humanity's first attempt to write some information down. These days the Yukaghir language is spoken by just a few dozen old men. 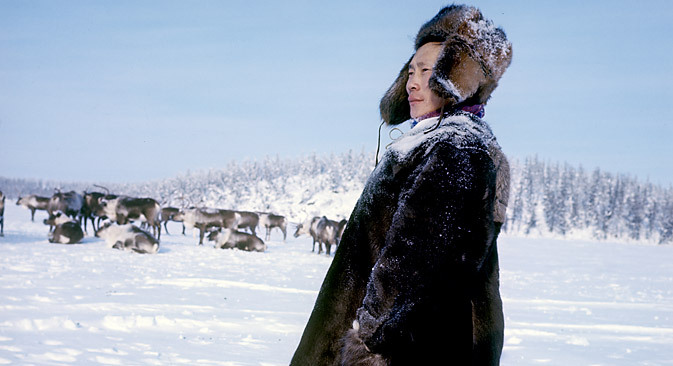 In recent years, several Yukaghir elders, fishermen and reindeer herders in Andryushkino, Kolymskoye and Chersky simultaneously and independently from each other began to try to save their language. One of them began to give Yukaghir lessons in the local school, another organized lessons in a school in Chersky, and the third set up a singing club. Another elder is trying to set up a children's camp in his garden. Unfortunately, none of them are very good at teaching, so children are not particularly taken by these lessons. These are timid, clumsy attempts — the last efforts of a dying people. In the morning we set off for the tundra. On the outskirts of the settlement there sits a cemetery. Previously local people did not use cemeteries and did not bury their dead. Firstly, it was very difficult to dig in the permafrost. Secondly, they did not have this notion of separating themselves from the world of the dead. They buried their dead in the camp, where death caught them, by putting them into log canoes erected on tall columns. One can still find these "air graves" in the taiga occasionally. Among the Chukchis, many old people who found it increasingly more difficult to carry on living, would ask their relatives to kill them. Our civilization keeps promising us something: progress, communism, eternal life. The local worldview does not promise anything. The world is as it is; there is nowhere to run away from the nature and death. The sun is shining. A blizzard is picking up, snowdrifts are forming, the snow is growing thicker and soon we find ourselves at the heart of a snowstorm. I suddenly get an acute feeling that for a thousand miles around there is nothing but the tundra. At last we stop at a river bend. Somehow, driving along an featureless tundra for more than 70 kilometers, we managed to reach exactly the spot we wanted. An hour of some more crazy driving later, I see the camp for the first time: a tent, several sleighs with dogs tied to them, junk lying on the sleighes, a carbine left leaning against the tent, something looking like a wigwam made or pine cones. It looks like an unbelievably tiny inhabited spot in the middle of a lunar desert. Nikolasha, a young herdsman with a face burnt by the sun introduces himself. “A bit blizzardy today, isn't it? It was clear before you came. Maybe someone here has sinned?” he asks, looking at me with a cheeky grin. The tent (called a "chum") is a square army affair on a wooden frame, except that it is made of hides. At the entrance there is a potbelly stove, beyond it in the center is a low table. The fire in the stove is kept burning all day. The floor is covered with hides. Reindeer hides are so warm that the cold from the permafrost does not reach through. There are three people inside the tent: the herdsman Nikolasha; Olezhek, a timid and a bit puff-faced lubber of a boy, who does domestic chores; and Larisa, a young woman with a rough face, swollen eyes and a husky voice. Their tundra is an area 300 kilometers by 500 kilometers. A Yukaghir who manages to survive in a Kolyma taiga, on the verge of the impossible, on the borderline between the animal and the human world, knows better than anybody else what it means to be human. First publushed in Russian in Russky Reporter.